Is a introspective and layered piece, revisiting tapestry as a experimental textured artwork, involving embroidery,knitting and weaving. Through the creation of a textured surface full of color and juxtaposed with different materials. Pushing the boundaries of color combination and composition. It shows the unseen, seeing the un-showable. Unusual object is my recent artwork is a hand woven tapestry piece, a experimental proposal between art and design, revisting tapestry as a rug and as a wall artwork, a large format woven element, creating a textured surface full of softness cotton texture and pairing with the black but furry of the wool, pushing the boundaries of sahape and composition, showing the unseen, seeing the un-showable. Unusual object is my recent artwork is a hand woven tapestry piece, a experimental proposal between art and design, revisting tapestry as a rug and as a wall artwork, a large format woven element, creating a textured surface full of softness cotton texture and pairing with the black but furry of the wool, pushing the boundaries of sahape and composition, showing the unseen, seeing the unshowable. 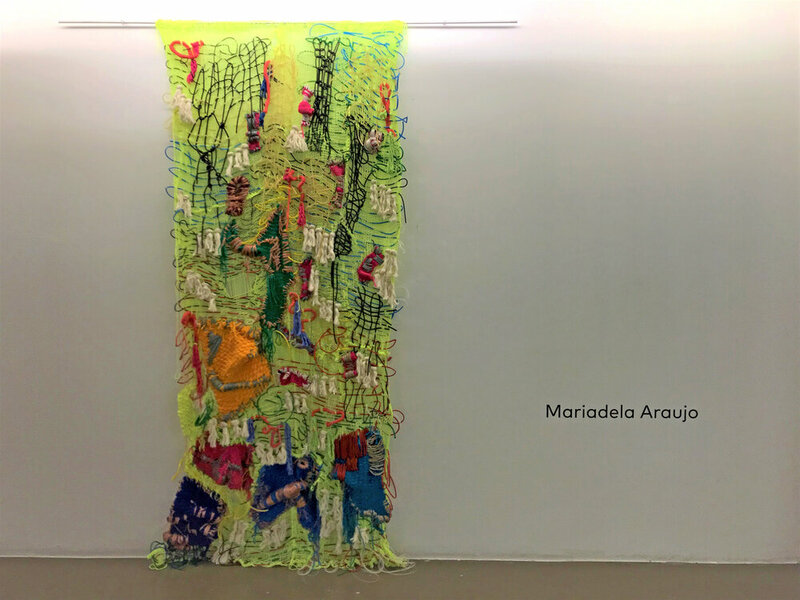 This artwork belong to the series unusual object, a large format woven element, creating a textured surface full of color and pairing with the white and soft surface of the cotton, pushing the boundaries of color combination and composition, showing the unseen, seeing the un-showable. Embroidery artworks series part of the creative process for the developing of the tapestries, a raw embroidery aiming for color combination and composition. Textile installation, created in a knit net and weaved with plastic, wool and cotton, is a yuxtaposition of ideas. 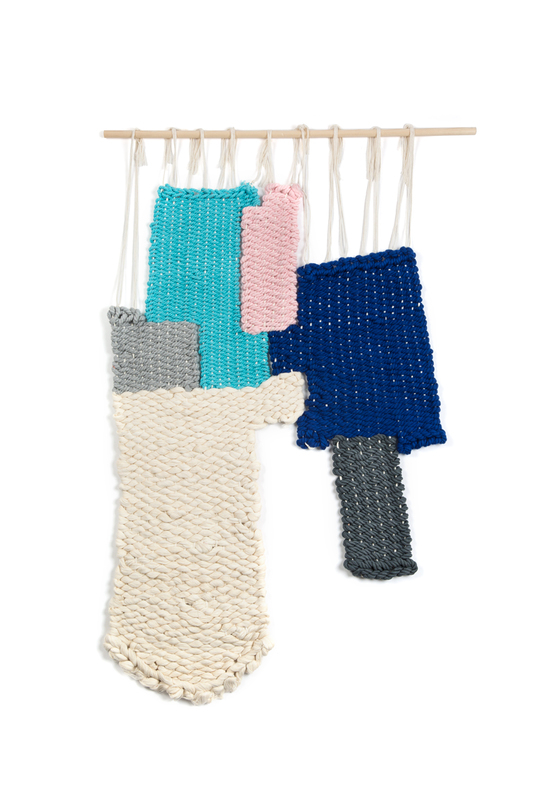 Geometrica is a series of 10 tapestries, hand woven in separeted looms, in cotton rope addinga sprinkle of color, an invitation to the viewer to play with the infinite possibilities of composition and combination. Geometrica is a series of tapestries, woven with a looser and more experimental hand, I manipulated the variables of traditional tapestry frame, and invite the viewer to think about the concept of a ‘frameless’ tapestry and how this can create multiple compositional possibilities. A color study composition with 2 powerfull tones. Chromocube is a texture and color experience. 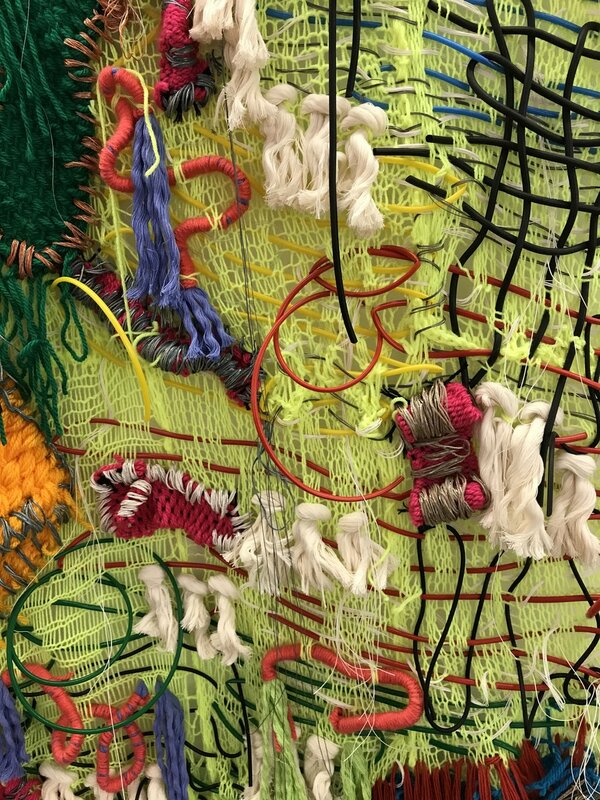 An interactive piece that opens up a perspective ,the color interplay with the textures woven in the tapestry, fiber, stitches and superimposition of materials provokes an reactions. The Chromocube is a deconstructed idea of my own work, The Tapestry, revisited in a form of installation, of the the idea of the separation, the geometry, the combination, the lines, converged in a cage, in a cube, inviting to enter, proposing to exit, suggesting of interaction. technical movements weaving the loom, filling the emptiness, creating them, a revisted idea of a penetrable sculpture, filling a gap in a setting space, making art public and citizens artist in their own way. Often understimate in the tapestry works, the back of a tapestry its never showed, this time, the back of the tapestry is and important part of the piece as the front, is a telling part, full of textures, full of layers, a especial place to look trhough colors. Chromocubeis a texture and color experience. TheChromocubeis a deconstructed idea of my own work, The Tapestry, revisited in a form of installation, of the the idea of the separation, the geometry, the combination, the lines, converged in a cage, in a cube, inviting to enter, proposing to exit, suggesting of interaction. 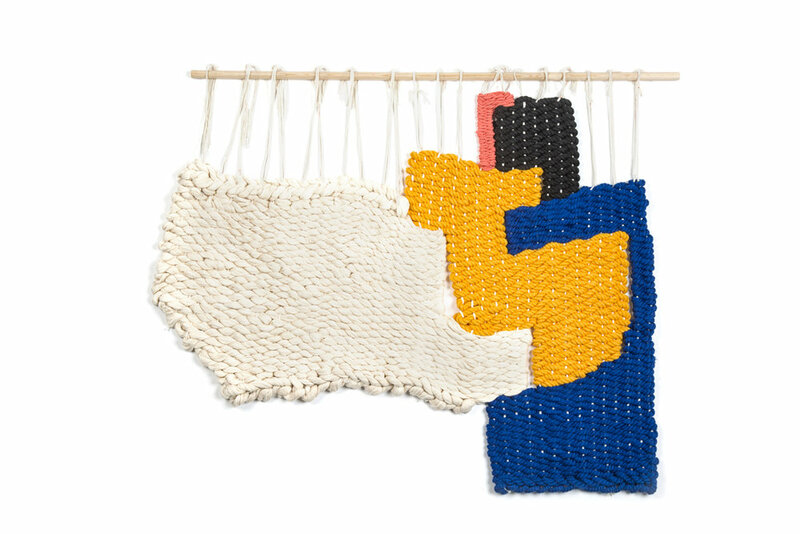 Hand woven tapestry studio piece created to develop a garment woven structure for a capsule collection.